Mike Hewitt landed in Asheville months ago to begin a work exchange. Through a program called HelpX, people all over the world are receiving room and board from a host in exchange for work. It’s basically a broader version of WWOOF. 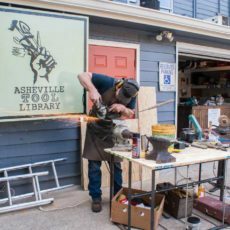 Mike heard about the Asheville Tool Library through Facebook, wanted to contribute, and showed up at an AVLTL work day in March. His response to a question of his skills was, “I can fix almost anything.” So he was put to work repairing small engines and other tools with us! Ever since, Mike has done repairs and maintenance on our small engines including rototillers, lawn mowers, weed eaters and more. In a conversation we recently had, Mike stated that he wants people to learn more about the many options available that let you live outside the standard or typical arrangement of paying rent or having a mortgage. He feels that many of us fall into the routine of working a job we dislike just to pay for things we feel we need. He worked over 25 years in the water & wastewater treatment industry, paying a mortgage, working for the man. One day it dawned on Mike that he only felt happy when volunteering, helping others, paying it forward, and giving back. We are so grateful and fortunate to have Mike on board the team of Asheville Tool Library volunteers. You may see him around. Asheville is lucky to have gained someone volunteering and building community as much as Mike. We hot pe his story will inspire others to give back and think creatively. He’s definitely making this town an even better place. Thanks for all you do, Mike!